It’s been a really tough end to 2014 and start to 2015. We all caught this wonderful cold bug that’s been hitting everyone around the Calgary area. It lasted about 3 weeks for the kids. John and Sophia were getting better around mid December but Jule was still taking a bit. Her cold symptoms were gone but she was really lethargic and would just sleep all day or if she was awake she just wanted to lay on her side and was uncomfortable on and off having crying fits. I took her into our family doctor and she couldn’t see anything wrong, but wasn’t able to see in her ears due to wax build up and so prescribed antibiotics for that just incase. The kids went with their Dad to spend Christmas with him. They came back on Boxing Day morning to spend Christmas with us and Jule hadn’t improved and was actually worse than when she left. We went home and tried to open gifts, but she just wanted to sleep so I put her down. She woke up at 2:00pm and I decided to take her into Urgent Care in Okotoks. I told the doctor there that she was uncomfortable, hasn’t popped normal, no fever or vomiting. So he had a listen to her tummy and noticed her stomach was distended. He ordered IV and x-rays and found she had a large mass of stool and was either obstructed or constipated. They transferred us to Alberta Childrens Hospital via ambulance and that’s where we spent the night while they did ultrasound, enemas, blood work, and tried to figure out what was going on. They sent us home at 4am and instructed us to give her Restoralax and hoped hydrating her and the enemas would get things moving. Later that afternoon on the 27th we were getting ready to go to my Mom’s for our family Christmas dinner. Jule seemed to be more uncomfortable and her stomach seemed more distended to me. 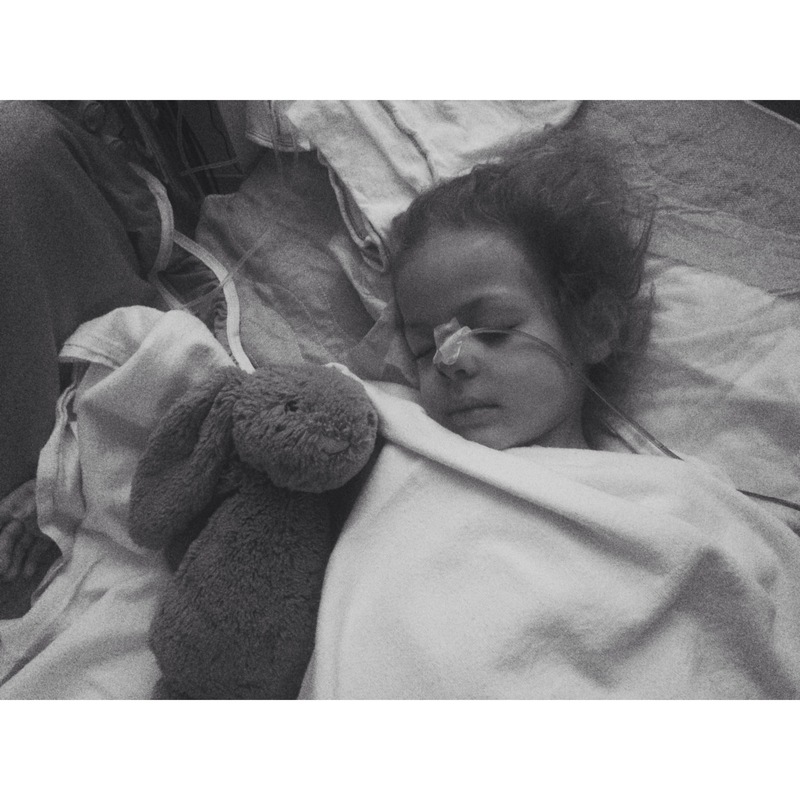 I decided to send my boyfriend with John and Sophia to my Moms and Jule and I headed to Alberta Childrens Hospital. When we walked into the emergency it was absolutely packed. The screen sin the waiting room said 4 hour wait. We stood in line for about 10 minutes and Jule wasn’t looking well, her colour was terrible and so thankfully when the nurse had a look at her and felt her stomach she sent us to triage right away and they got us a bed within 10 minutes of that. I told the nurses and doctors what had been going on for the 100th time, they looked at her old charts. After doing another ultrasound, blood work, urine analysis, and x-rays, they said her stomach was still full of stool and gas, but no sign of Intusessception (where the bowel overlaps and causes an obstruction), and they felt like she was just very constipated. They sent us home at midnight, instructed me to give her 4x the adult dose of Restoralax, get the stool moving and give her 2 days and she should poop. So we went home and did as instructed. It took 1.5 days to get things moving and for Restoralax to do its job on December 29. And when it did it was a mess, which I’ve never been so happy to clean up. Jule then seemed to be more like herself, she was moving around more, she played with her dolls from Christmas, and was eating and drinking well. Her tummy was still distended, and she went through fits where she was inconsolable. She was having bowel movements but it was watery. January 3rd she seemed well and ate dinner fine. But at 4am I went into her room to check on Sophia who was stirring and found Jule had thrown up and went back to sleep at some point during the night. I called Health Link and they told me to take her into ACH within 4 hours. We went back to ACH and this time the waiting room at Emergency was nil. We went right through and back into a bed. I went through the whole story over and over again with the triage, nurses, student nurses/paramedics, and pediatricians and student pediatricians. I told them Jule had an MRI booked at ACH for a follow up on her Arachnoid Cyst. They did more ultrasounds, x-rays, blood work, IV. At this point Jule has been poked and prodded so much and it wasn’t getting easier to see. I tried to be really patient with the student nurses who practiced IV and poked her twice before getting a nurse with more experience to try. They felt terrible and I have to admit I wish they hadn’t practiced on her. They seemed to be on the same thinking that she was constipated and needed more Restoralax and get her flushed out. They kept talking about how with her being Autistic her diet is probably not the best and would cause constipation. But I told them her diet was actually not terrible, she eats pretty well and nutritional foods and fibre. I had a feeling it was more than just constipation. They decided to admit her to hospital and get her a room. She had her MRI the following morning and so they didn’t want to send us home just to be traveling back and forth, and to be honest I was not comfortable with them sending us home again. She was continuing to throw up, and was in no condition to go home. 1. The patient had abdominal surgery and scar tissue is causing a blockage. 2. The patient swallowed something that caused the blockage, but nothing indicated that on x-Ray. 3. The patient is one of 2% of cases where they have a congenital band that is wrapped around the bowel obstructing it. They didn’t feel it was any of the above, so they said to continue with Restoralax and enemas. Poor Jule continued to throw up over night. January 5th, Jule isn’t getting any better. The enemas were successful, but she hadn’t pooped on her own. They continued with Restoralax. Jule’s Dad came to the hospital and I went home to see John and Sophia and get some rest and a change of clothes. John was really concerned about Jule. 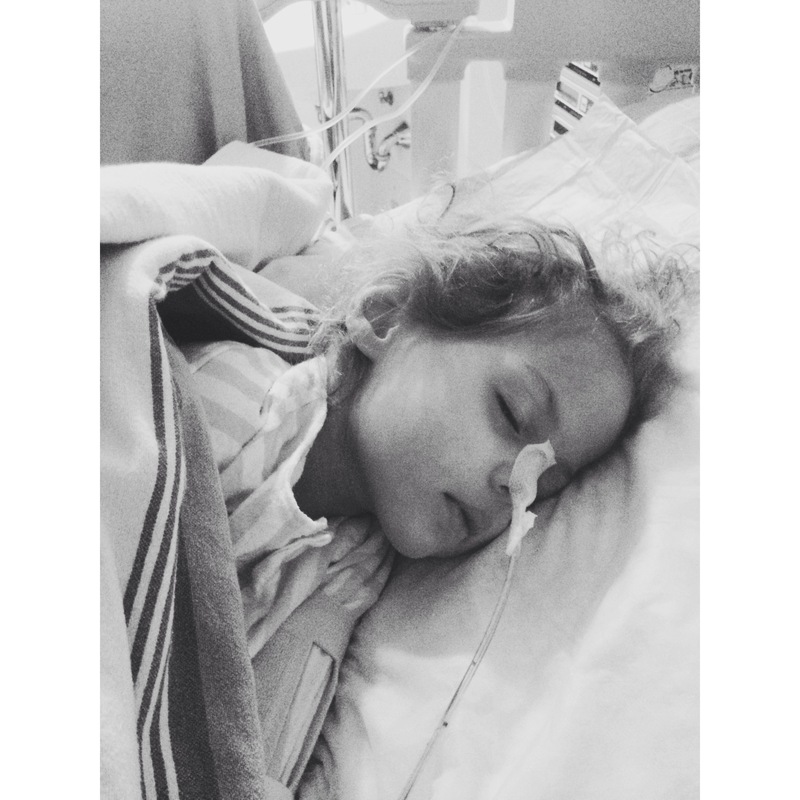 January 6th, Jule’s Dad updated me in the morning and said that they put in an NG (tube through nose to her stomach) to decompress her stomach. That was helpful and relieved some pressure. Sophia had woken up that morning at home with a fever and chills, so I stayed home with her that morning. I then got a call from her Dad around 1pm saying the surgeons decided it must be an obstruction and wanted to operate. They booked her in and she would be going in within 6 hours. I rushed to the hospital with John and Sophia and gave them to their Dad’s girlfriend who was waiting in the parking lot. I just missed Jule as she was heading to the OR and was pretty upset that I hadn’t been able to be there for her. The surgeon and her Dad came out and she discussed what they were going to do. They either thought it was Intusessception that was missed on the ultrasounds, or it was a congenital band. Surgery took about 2 hours. The surgeon came out and told me it was in fact a Congenital Band wrapped around her bowel. It’s only less than a handful of bands she’s seen in 25 years. The surgeon explained that she took a calculated risk by deciding to leave the bowel intact vs cutting the section out where the band was. Only half of the bowel was looking damaged by the band, so she felt it was less risky leaving it vs cutting it out and risking leakage. They also had asked before the surgery if we would be ok with them removing her appendix as well. They felt with her being non verbal and probably a higher pain tolerance that if it ever caused issues down the road that she wouldn’t be able to let us know until it was ruptured. Her dad and I agreed to have that removed. She came back to the room to recover and didn’t have a great night. January 7th, after a restless night she was still uncomfortable most of the morning. She finally settled around noon and slept really well all afternoon and night. Today, she has been sleeping all morning. They’ve cut her morphine down and will be weaning her off of it. The plan for today is to get her moving as she hasn’t passed gas and moving will help get things moving through her bowels. The NG tube hasn’t been getting much fluid from her stomach, and so they think it must be moving through her bowels as it should. They will clamp it for an hour to see how her stomach and bowels do on their own. If they do ok the NG can come out, which will make her extremely happy because it’s very uncomfortable and they have these restraints on her arms to stop her from being able to bend at the elbow so she can’t pull the NG out. So right now we are just waiting for the nurses to bring some floor pads for her to get on the floor and hopefully crawl and maybe walk. So hopefully that will go well and help get her passing some gas. John and Sophia are with their Dad and all of them are sick with the flu, so it’s been Matthew and I at the hospital with Jule. We are so thankful for family and friends around us who have offered to help out and for your support, prayers and positive thoughts. It’s been a crazy month for us and on top of this all Matthew had carpel tunnel surgery on Dec 11th and he’s been recovering from that surgery as well. But he’s been here by my side helping with the kids and I couldn’t be more thankful.